This FREE adventure clocks in at 28 pages, 1 page front cover, 1 page editorial, 1 page SRD, leaving us with 25 pages of content, so let’s take a look! This being an adventure-review, the following contains SPOILERS. Potential players may want to jump to the conclusion. All right, only GMs left? Great! This pdf kicks off with essentially a highly detailed gazetteer of the city of Remballo, which is, btw., fully mapped in nice b/w-cartography. A pronunciation guide for the name, a full settlement statblock – all there. Relevant for this adventure would be to know that Remballo is essentially the home-base of the powerful Borgandy family, who is big in finances – like safe-keeping treasures for adventurers…for a price. I really like this notion, since the logistics of keeping a hoard of dangerous, highly volatile magical items is an often neglected component in adventures I personally like to emphasize. But back to Remballo – from the local temples to the important tradition of toasting when gambling (also a nod to Chuck Wright, FGG’s layout artist and a damn cool guy!) and an inn, this brief gazetteer is pretty well-written and compelling, painting a picture of a commerce-driven town in a time of turmoil, as the protectorate that once guaranteed stability crumbles and new power dynamics arise. But you want to know about the module, right? Well, we begin with one of several hooks – whether contacted by the Borgandy family, by the city watch or another hook, they will have to investigate the area surrounding Dead Fiddler’s Square – a neighborhood fully mapped for your convenience. I love the fact that we get a GM and a player-friendly version of this map, though the player-friendly version sports numbers. Why am I not starting my usual rant? Because the numbers are deceptive – they do not pertain to the actual locations, but the number of stories of the houses! This is pretty brilliant and awesome. The interesting thing here would then be one of the most concisely written investigation set-ups I’ve seen in quite a while – with a level of detail and a requirement for discreet inquiries and no less than 35 (!!!) 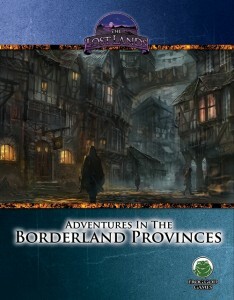 investigation locales to check out, all with read-aloud text, mind you, the area is ultimately a glorious micro-sandbox that sports a level of detail scarcely seen in PFRPG-modules. In fact, this is further enhanced by the actual target area sporting an even more detailed room-by-room map – and yes, there is dungeon-exploration to be had as well – ultimately, the different hooks all tie together in a rather round climactic exploration that sports a truly dangerous adversary the PCs will definitely remember – oh, and I’ve failed to note that the conclusion, when handled properly, leads to connections with the Borgandys, the thieves guilds and the city watch, right? So yes, adventure galore to be had here! Editing and formatting are top-notch, I didn’t spot any glitches. Layout adheres to Frog God Games’ 2-column b/w-standard and the pdf comes fully bookmarked for your convenience. Artwork and maps are copious and thematically-fitting b/w. This book’s approach is glorious and I am of the deep conviction that we need more modules that feature this level of realism. In fact, I’d probably drool and slobber all over a complex investigation in a big city (like, mega-adventure-sized) with this level of detail. Have I btw. mentioned that there are none of the boring level 1-adversary combos to be found herein? Templated foes, multiclass’d enemies…NICE! The player-map depiction is also downright genius. In one word: I love this module. I got it before the KS went live so I could playtest it and it ran as a stunning success – my players loved it and it proved to be a challenging, very rewarding experience. I can wholeheartedly recommend this module and will award it 5 stars + seal of approval – even if you’re not interested in the module itself, it makes for a great neighborhood-sourcebook you could scavenge for your city, adding yet another level of usefulness to this pdf. Here’s the KS for this damn cool module’s parent-books!